Designed for those looking to make their e-Portals stand out and breed excellence. For the most immersive, top quality Joomla LMS around, the King Professional package is all you need. Our complete features suite allows you to create the best learning portal for your needs. Event Management that has been designed with ease of use in Mind. This is the most thorough Event Management system for Joomla. Our Event Manager has a complete list of features with more on the way. Looking to make your mark in the field of outstanding online learning and e-commerce portals? With our Intermediate package you can add the professional touch to your platform and create new standards of performance. Need to create a learning portal that both looks professional and performs all the tasks you need it to? Our Joolma LMS King Basic package has all you need to do just that. Affordable and full of powerful features, the Basic package is the perfect place to start. The most comprehensive starter package at the most competitive price (free!). Ideal for those looking to start their first learning portal or trying to develop a platform for a more immersive learning experience. This is the Professional version of our Joomla Distance Learning Management System. It comes with all of our Joomla extensions (components, modules, plugins) which are fully integrated into the LMS. Our specially designed Joomla Distance Learning Management System (LMS) has been developed to work on Joomla 3. It provides you with an easy to use and manage e-Learning portal. This system offers you everything you need from online testing and exams to presentations and quizzes. See the Joomla LMS Extensions section of this product description for the full list of extensions that are available. You don't have to be a guru or showroom expert to use our Joomla LMS. 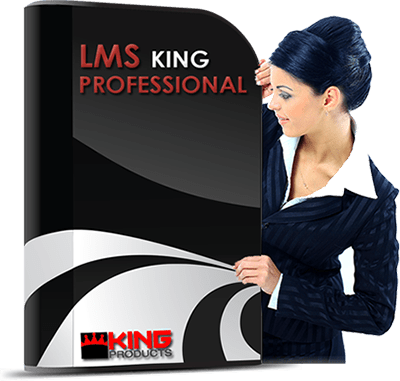 Our easy to use wizard will turn you into an LMS KING. Our professional version of this exclusive eLMS will allow you to further the learning and expertise of yourself and your team while avoiding the needlessly overcomplicated menus, instructions and functions which some software applications in this sector seem to favor. For a fuss-free, effective and professional Joomla LMS which offers best value for money you need look no further than Joomla LMS King. Once payment has been completed, you will immediately be given access to your downloads section on our site, where you can download the installable component in zip format. * You must renew the license after one calendar year for continued updates and support. Discounted renewal rates available. See information below for details. All purchases are subject to our terms and condition of use. Your license key is valid for one year from the purchase date. You need an active license key for continued access to automatic updates and support. If you renew your license each year you’ll receive a huge 40% discount off the full retail price! Yes, If you need to upgrade your license, please contact our support staff. We have many free add-ons and several third party add-ons (free and paid) available for license holders. If you have either an intermediate or professional license you also receive free access to several pro add-ons, plus any additional add-ons we release in the future. The Pro Add-ons are only available to Professional license holders and cannot be purchased separately. Yes we do! We stand behind the quality of our product and will refund 100% of your money if we are unable to fix a bug that you report within 14 days. Yes! Automatic updates are available free of charge to all users with a valid paid license key. Yes! Top-notch customer support is key for a quality product, so we’ll do our very best to resolve any issues you encounter via our support page. Will Joomla LMS King work on Joomla.org? No, Joomla LMS King will not work on Joomla.org. It only works on self-hosted Joomla! installs. "With Joomla LMS King, you can maximize the elearning potential of your students by presenting them with courses, presentations and quizzes prior to them attempting the actual exam to get their certificates. This way, they get the education that they need."